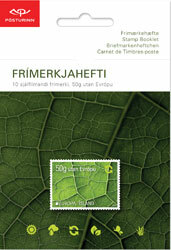 Both stamps are also issued in a booklet of 12 self-adhesive stamps (6x each stamp). 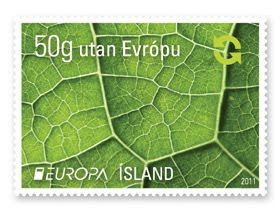 one stamp (50 g. to Europe value) out of a pair (only the left stamp is bearing the offical Sepac logo). 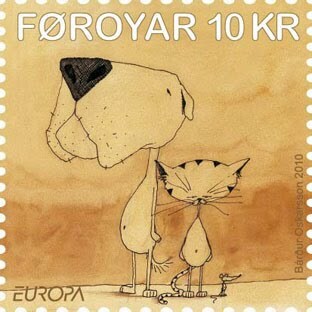 First version of the stamps published in early 2011. Note that the values changed and are now placed on the top. A recycle symbol replaced the sun logo on the second stamp. 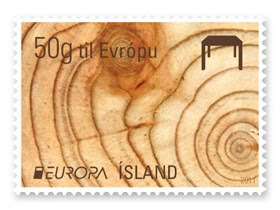 On the 2011 Europa stamps you'll see a new logo. A small square and black & white element, symbolic reminder of the mailbox, has been added in front of the word Europa. As it is impossible to register a plain text-logo, a design element had to be added to the text "Europa". 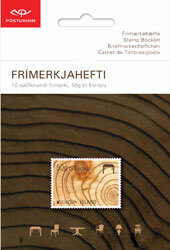 PostEurop will with this new logo be able to have a better control on missuse and on non official Europa stamps issues. This new logo can already be seen on the 2010 Europa stamp issue of Switzerland. The Swiss post has the copyright rights on the Europa logo. In 2011 this logo will be featured on each official Europa stamp issue. The present Europa logo is in use since 1993. That year PostEurop took over from the CEPT the Europa stamps issues.